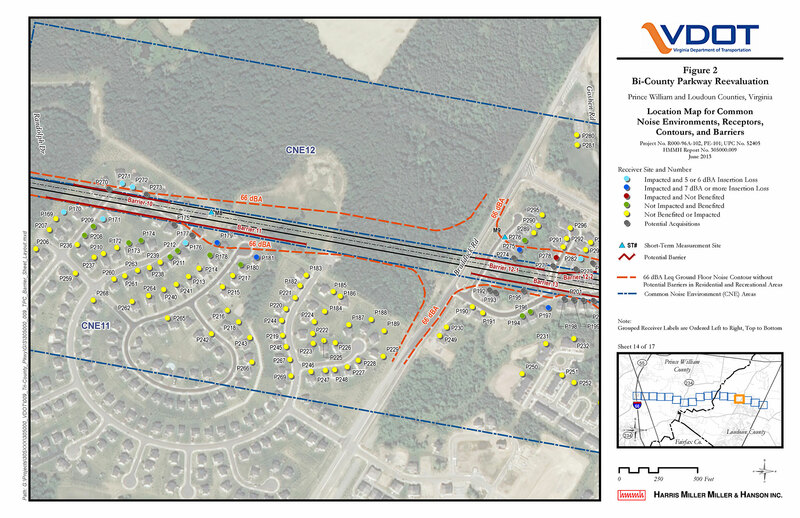 HMMH’s noise analysis for the Bi-County Parkway Environmental Reevaluation project followed the 2011 FHWA regulations under 23 CFR 772 and the updated Virginia Department of Transportation Highway Noise Guidance Manual. HMMH conducted a noise impact and preliminary barrier feasibility assessment using the FHWA’s Traffic Noise Model to update a noise study HMMH had conducted in 2004. The project involved the construction of a new four-lane divided facility within a new right-of-way and on a new alignment between Route 50 west of Route 659 and Interstate 66 at Prince William Parkway. Under the 2040 Build Alternative, 111 residential units and 32 recreational receptors were predicted to be impacted by noise. Noise abatement by barriers with a total length of 1,500 feet was found to be feasible and reasonable to benefit some impacted residential areas. The barriers would benefit 17 impacted residential receptors as well as an additional seven residences.